Tom Reynolds uses a Nikon D-300 dSLR camera. The underwater case by Sea Tool is very compact and sturdy. All camera controls are available. The viewfinder has a straight magnifier from Inon attached. The strobe(s) are Inon Z-240 models in sTTL mode. The strobes are fired via a fiber optic cable that senses the camera's pop up flash. On this camera Tom only uses the Nikkor AF-105-VR and the (older) Nikkor 60mm lenses in flat ports. This means that this camera is set up only for macro and fish portraits and cannot be used for wide angle shots. 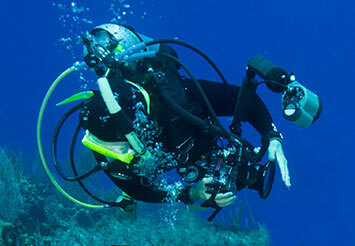 Tom also uses a Nikon D-200 dSLR camera in an Ikelite underwater case. Again, all camera controls are available. The Ikelite Ds-125 strobes(s) are fired using standard Ikelite iTTL. In addition to the above macro lenses, the D-200/Ikelite is also capable of wide-angle using a Nikkor 12/24 lens in an 8" dome port. 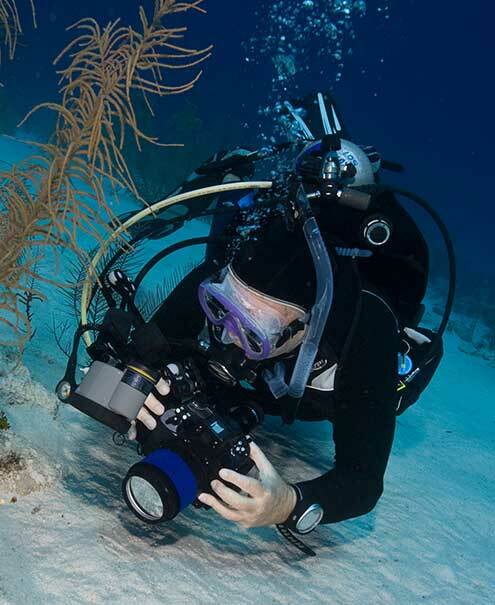 Ginnie Reynolds uses an Olympus E330 in an Olympus underwater housing. The Inon Z-240 strobe works in TTL mode via an Athena TTL converter. Ginnie uses an Olympus 14/54 zoom lens which is capable of both macro and wide angle shots. Although macro shots taken with this lens are not quite as exquisite as the Nikkor 60 or 105 lenses, and wide angle shots are not as wide as those taken with the Nikkor 12/24, the Olympus 14/54 is a lens that is suprisingly effective and versatile at obtaining decent photographs at both ends. The Olympus E-330 is the ONLY camera that possesses an effective liveview for underwater photography. Whereas most dSLR camers, including the Nikon D-300, have a significant autofocus time delay due to a mirror flip from the liveview viewer to the camera's sensor, The E330 is unique in that it has a separate sensor for the liveview. The result is no autofocus delay.